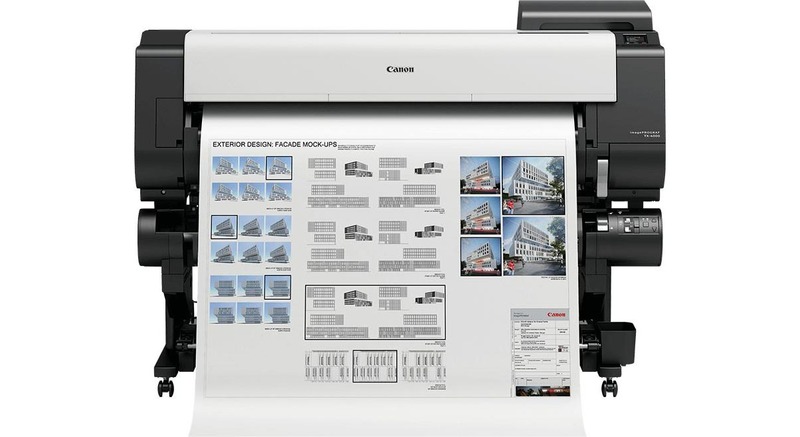 Designed for professional environments that require large prints, the imagePROGRAF TX-4000 Large-Format Inkjet Printer from Canon can handle cut sheet and roll media with a width of up to 44″. It offers a maximum resolution of 2400 x 1200 dpi to create images in stunning quality. Tailored to high productivity environments, the printer’s TX stacker output tray can hold up to 100 sheets of ARCH D or ARCH E pages, and can also be retracted when not in use to reduce its footprint. One of the main advantages of this printer for field work is in its Lucia TD pigment ink system. Composed of five colors including matte black, the ink balances bleed resistance, black density, and water resistance for an optimal result. It is designed to produce fine lines and sharp text even on non-coated media, and when used with water-resistant paper it can withstand the outdoor conditions of a construction site. And to make things even easier, an automatic media loading setting allows you to simply place the roll onto the holder and let the printer feed it into the proper position, saving you time and effort during operation. In spite of its notable print quality, the TX-4000 comes equipped with several security and connectivity features. Inside it is a 500GB encrypted hard drive, which can be securely erased if needed to help deter any attempts at data recovery. Printing jobs can be sent through traditional means via USB 2.0, via Wi-Fi when connected to the same network, or straight from a thumb drive via direct USB printing. Additionally, included Direct Print & Share software allows you to upload files to a cloud server and share them across multiple sites for easy use.